On Sunday our Chief Exec, Sally Yeoman and St Helens LINk’s Jayne Parkinson headed over to the magnificent Stobart Stadium to chat with Widnes fans before the team played Hull KR. There inside the glorious North Stand (where I used to have a season ticket), they had the opportunity to talk to Widnes supporters and share our plans for the redevelopment of St Marie’s. 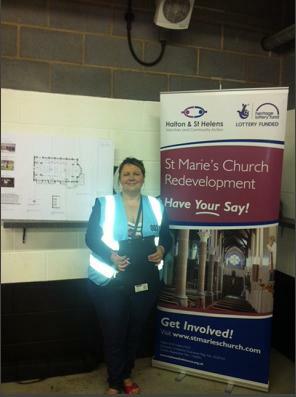 High-vis on and ready to talk heritage. 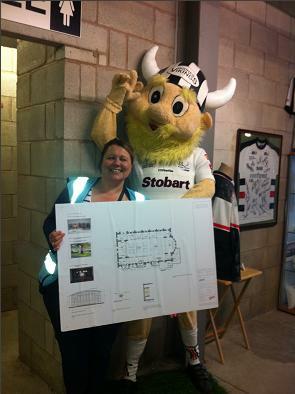 Sports finest mascot (and local legend) Kemik seems pleased with the plans. Jayne chats to a Vikings game. If you do love history or heritage and you’ll partial to a bit of rugby league. Don’t miss out on the chance to visit the superb Widnes Rugby League Museum. For more details, please visit http://www.widnesrlmuseum.co.uk/. I’ll be collecting the views of local people in Tesco’s in Widnes on Thursday from 10am till 3pm so please do pop in if you’re going to be in the area! Don’t forget that if you want to Have Your Say, you can! Simply click on this link to visit on our online survey. Thank you. It will only take a few moments of your time and it could a massive difference to our project. 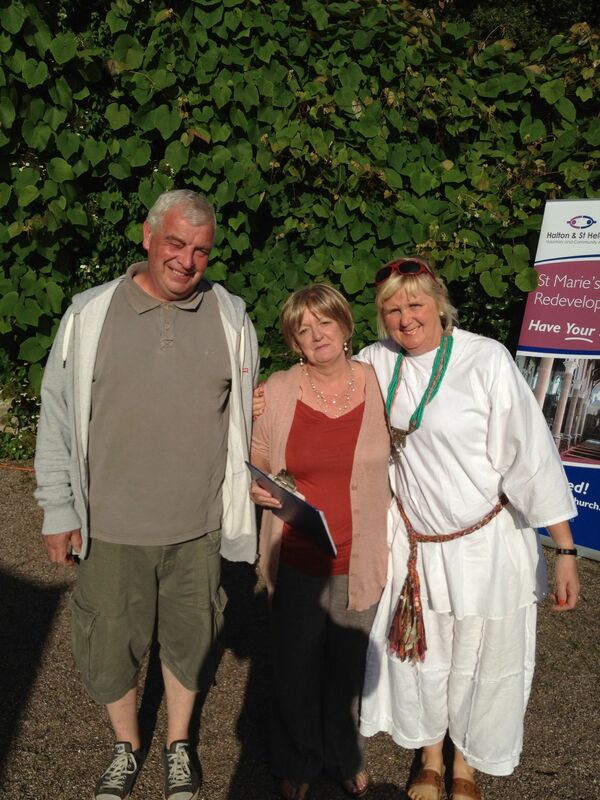 On Friday evening, Irene Bramwell and I had the pleasure of attending an event at Norton Priory Museum & Gardens. If you’ve never been to Norton Priory, you really are missing out. I don’t think there’s a more beautiful outdoor setting in Halton than the Walled Garden. 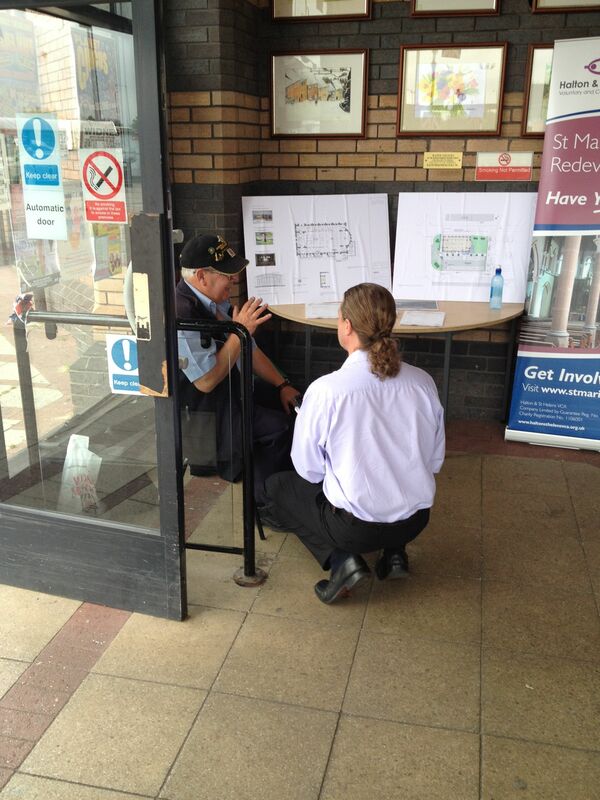 More importantly, we managed to chat to several local people who were keen to hear about our plans for the church. For more information on Norton Priory Museum & Gardens (including details of all their summer activities), please visit http://www.nortonpriory.org/. 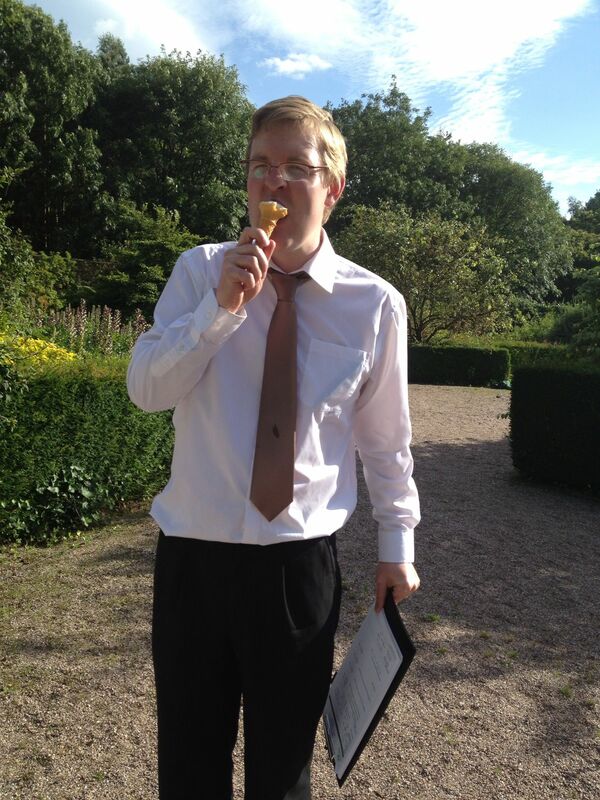 A chance to enjoy some homemade ice cream – with disastrous consequences for my tie. 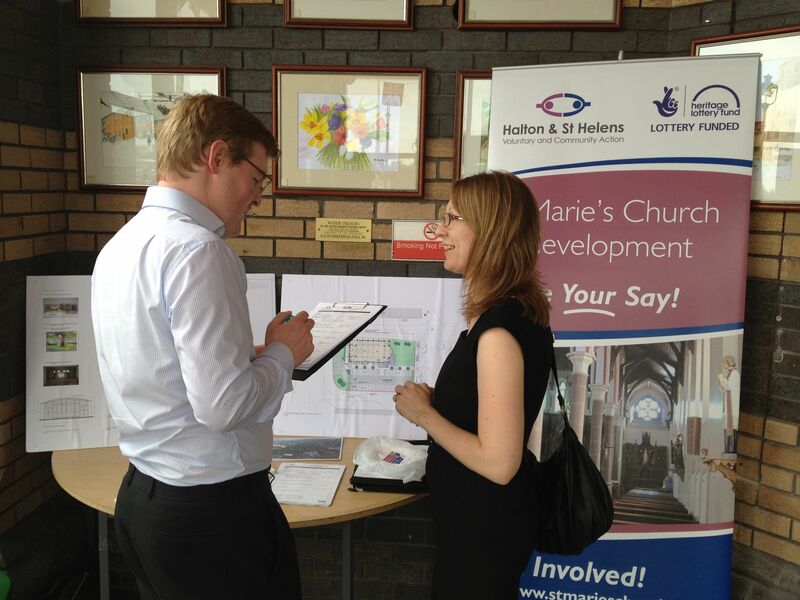 Former parishioners at St Mare’s Church debate the redevelopment with Irene. 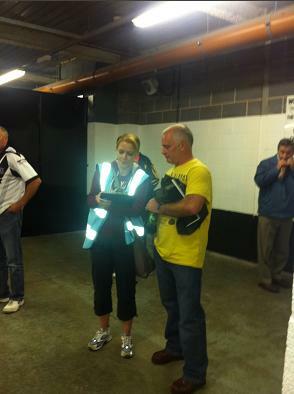 Thanks very much to Irene for coming along to help on the night. 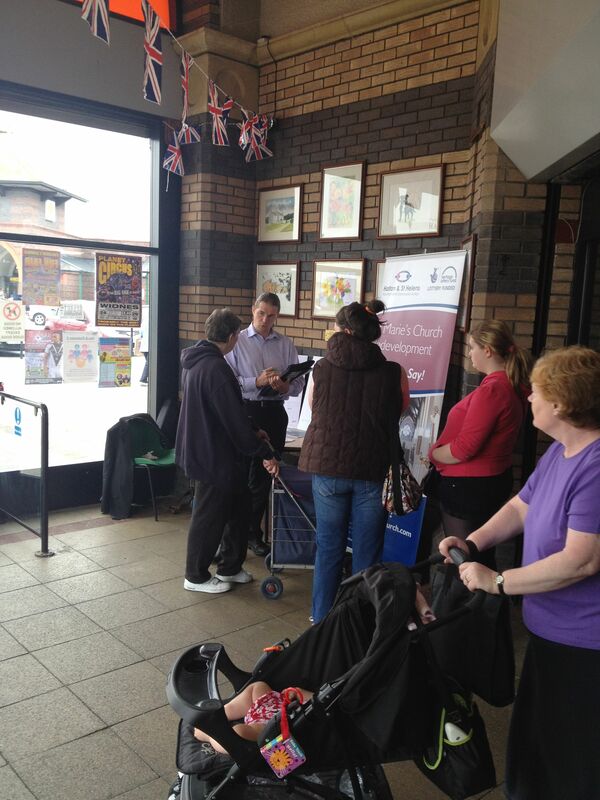 I’ll be collectingf the views of local people in Tesco’s in Widnes on Thursday from 10am till 3pm so please do pop in if you’re going to be in the area! 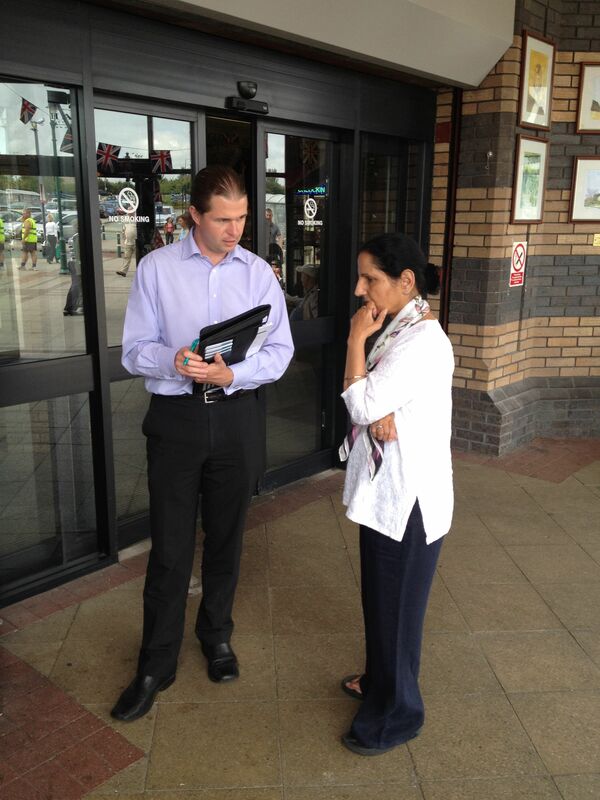 On Tuesday 25th July, I was joined by David Waterfall (from Pulse Regeneration) as we set up camp in the foyer at Widnes Market. 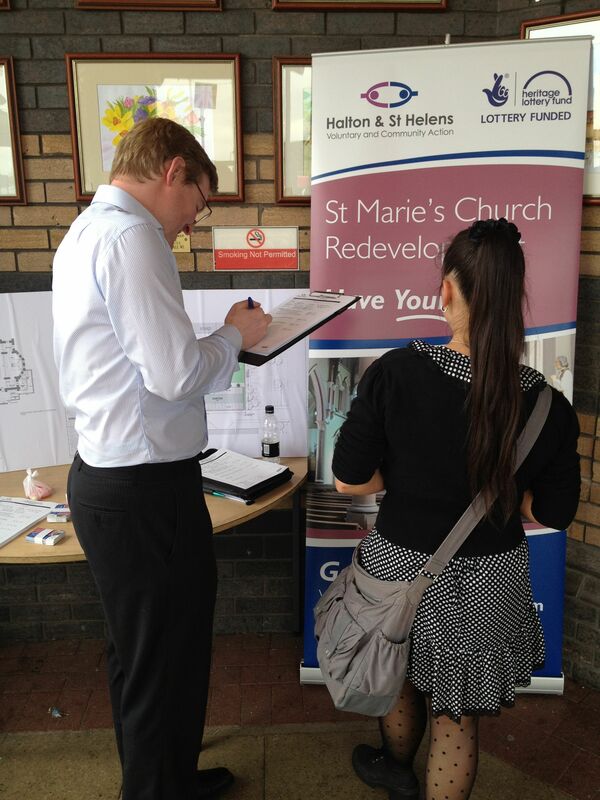 We had a brilliant day chatting to visitors to the market about the proposed redevelopment of nearby St Marie’s Church. The responses we got were universally positive. A refeshed David settles in for a day of Consultation. A former parishioner has his say. 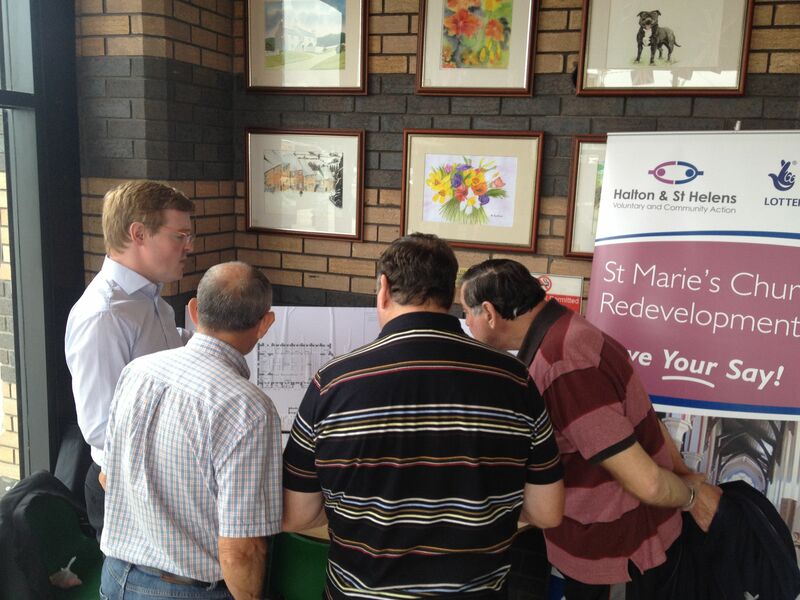 Former parishioners chat to David about the plans. I got the chance to speak to 3 former Altar Boys at St Marie’s Church. This former St Marie’s parishioner is very hopeful she’ll get to sit inside the church once again. 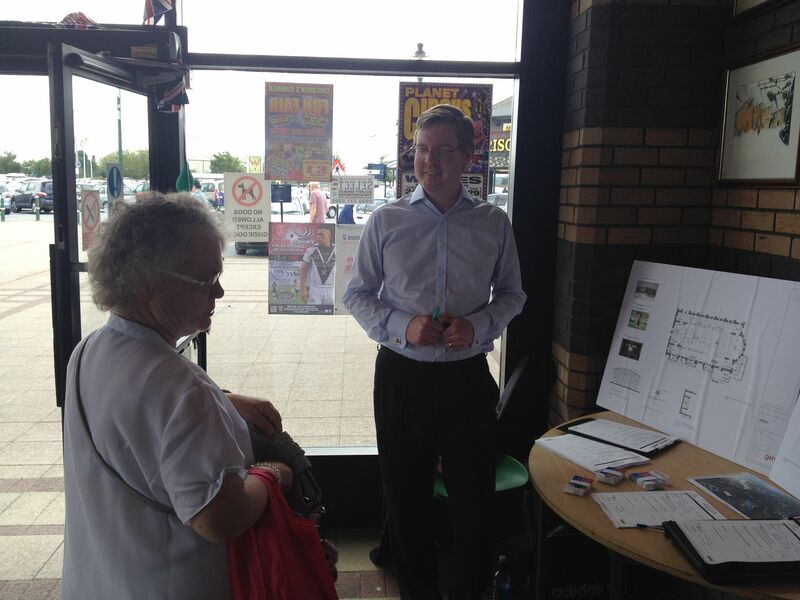 A lady from Liverpool stops by to add her support to the project. It’s lunchtime and someone visiting the market to buy a sandwich takes a moment to talk to us first. David captures the views of local people. A HBC employee stops by to lend her support. 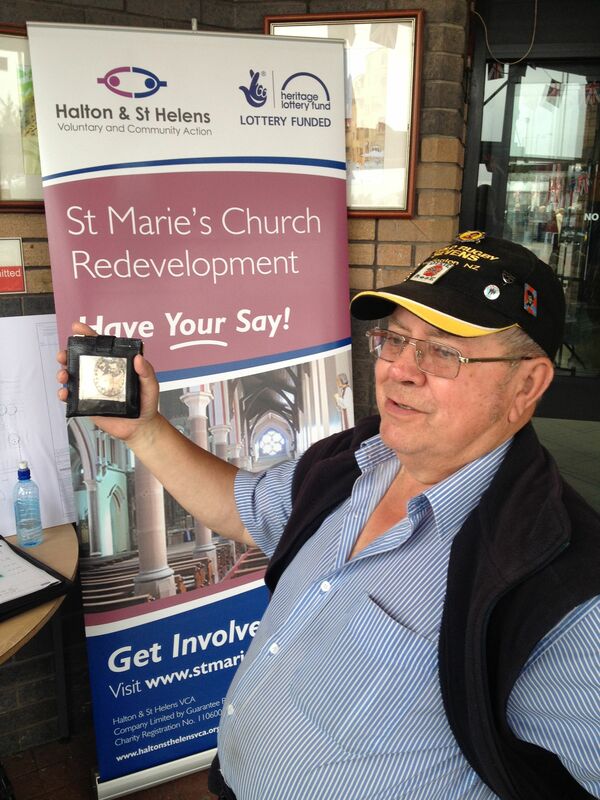 This gentleman revealed that he carries a photo of one of the former priests at St Marie’s Church in his wallet! Me chatting to a former parishioner. Halton & St Helens Voluntary and Community Action are eager to breathe new life into a currently disused church in Widnes. 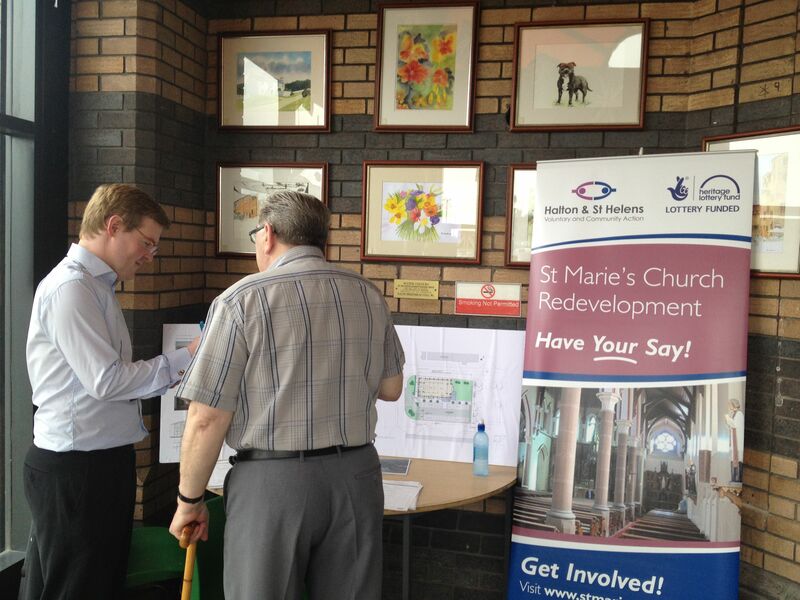 We want to redevelop St Marie’s Church, restore it to it’s original beauty and re-establish it as a hub for the local community. 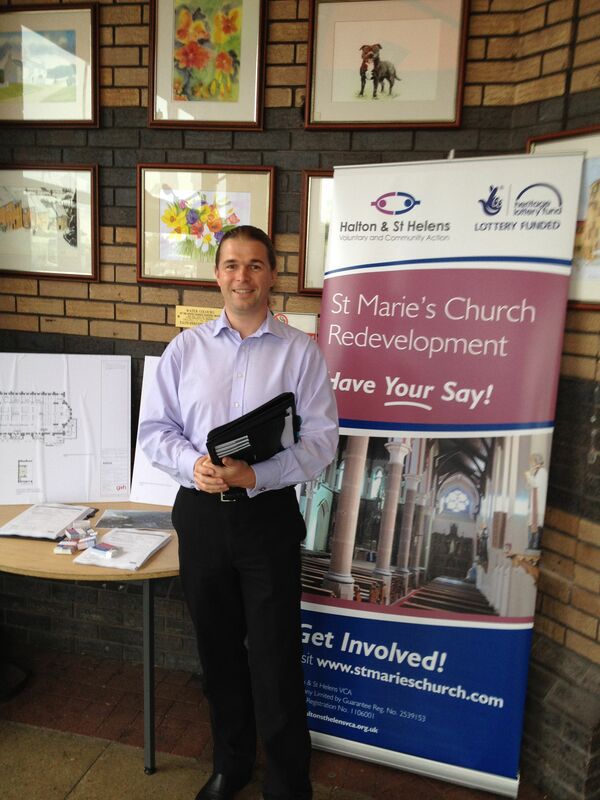 Hopefully, with support from the Heritage Lottery Fund, we can turn St Marie’s Church into prominent Local Heritage Centre which can inspire visitors to learn more about their history and the history of the town. 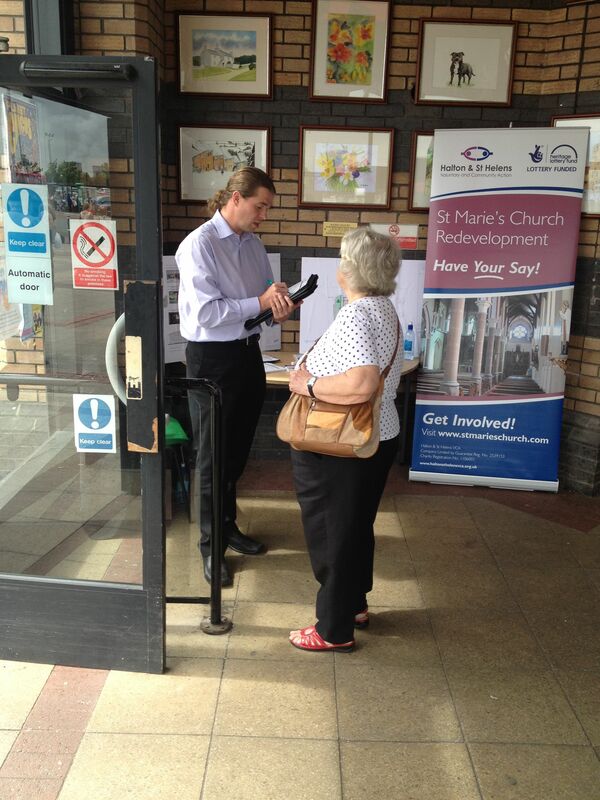 We want you to tell us what kind of heritage displays and activities you’d like to see in the church. Please take a few moments to complete the survey below. Your support could make a massive difference in our plans to reopen the Church’s doors and begin a new chapter in the history of St Marie’s. Here’s poor Jayne trying to enjoy the glorious view from the balcony inside St Marie’s when I whipped out the camera and started asking questions. Incidentally, Jayne and I agreed that the balcony potentially makes for a perfect setting to eat your sandwiches at lunchtime. Halton & St Helens VCA’s Capacity Team Leader, Chris Carlin joins me in the centre of the church to discuss a wide variety of topics including ghosts and Multi Purpose Areas. Many thanks to Jayne and Chris for taking the time to speak to me. 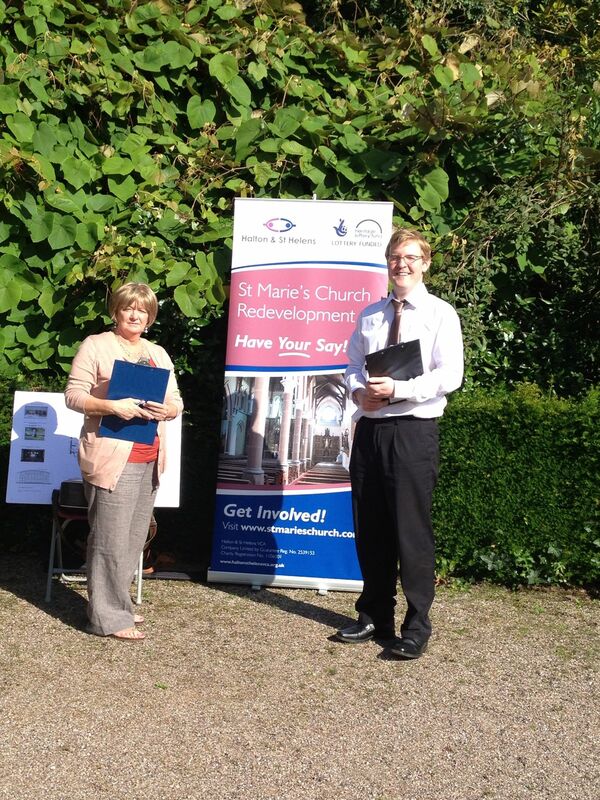 During our visit to St Marie’s, I got the chance to catch up with two members of Halton & St Helens VCA’s Board of Trustees; Jean Mulford (Chair) and Justin Hill (Vice Chair) and found out what their first impressions were of the inside of the church. Many thanks to Jean and Justin for taking the time to speak to me. Here’s my chat with Keith Williams from local development company Morbaine. 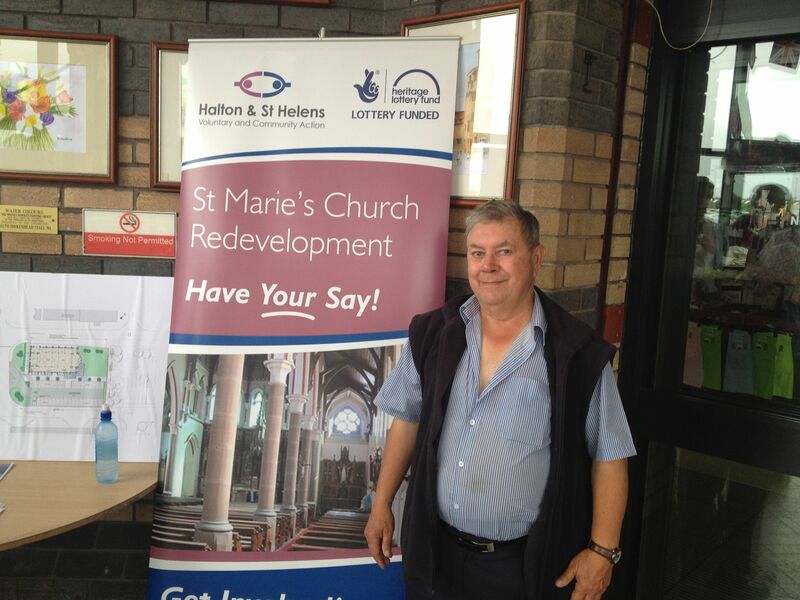 He explains why Morbaine are backing Halton & St Helens VCA’s Heritage Lottery Bid for the redevelopment of St Marie’s Church. Many thanks to Keith for taking the time to speak to me.